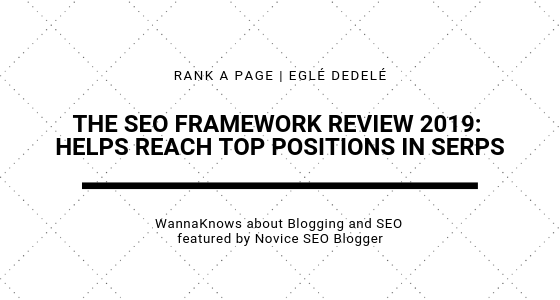 The SEO Framework plugin for WordPress is an outstanding tool that can help your website reach those desirable top positions in SERPs. It is a customizable plugin that has Free, Essential and Premium plans. Each of these offers extra extensions suitable for different SEO tasks. You can add the extras using companion Extension Manager plugin. This review by Eglė Dedelė gives a very nice overview of the history, features, ratings and pricing of The SEO Framework and the different plans (Free, Essential and Premium). I fully agree with Eglé that if you don’t have at least basic knowledge about good content and keywords, Yoast is the best choice. But if you are a more experienced writer, you better go for The SEO Framework, while it’s excellent, it doesn’t bother users with annoying advertisements, you get lifelong plug-in updates, AND it outperforms Yoast on 10 main points. The article mentions the different prices and the overall assessment based on prices is 3.5 out of 5. I would like to indicate that those prices relate to multiple licenses. Perhaps that will put things in a different perspective. Essentials – $49 per year; this is for 2 licenses. Premium – $99 per year; this is for 4 licenses. Enterprise – $299 per year; this is for 8 licenses.